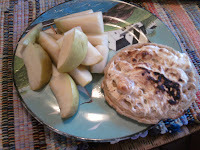 The weekends are a calorie-BOMB usually, and this one proved no different. In an attempt to keep it real with you, I will share the details of my over indulgent weekend filled with delicious food, wine, and relaxation. Things started out okay on Saturday. 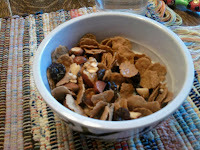 Breakfast was Fiber One Raisin Clusters with almonds for healthy fat and 1% milk. I went to a kick boxing class and got a minimal work out. It was actually a lot easier than I would have liked but I guess it's better than nothing. I had a huge sweet tooth this weekend... you'll see... so for lunch, I wanted peanutbutter and fluff. Of course, we had no bread, so I had to improvise. I used a whole grain eggo waffle and topped it with the PB & F and put it in the toaster oven. The waffle crisped up nicely, the PB oozed through the whole thing and the marshmallow got golden brown. It felt like such a treat. I had a pear too... and I think some coffee in there. Okay it looks a little burnt but whatever. Here is the climax of my food weekend. Amie and I went into Georgetown for a cupcake and some coffee. WOW. You have to try these babies. It is unbelieveable how good they are. We split a red velvet and a vanilla with chocolate frosting. You know I'm a chocolate junkie but the red velvet was so incredibly delicious. We both got coffee and enjoyed them in the privacy of my car. It felt very much like overeaters anonymous but it was so worth every last calorie. Interestingly enough, the whole Georgetown Cupcake store was over crowded and we were stuck in front of some type-A personality...witch. She was trying to direct traffic in there and here is one of her direct quotes... "SOMEONE (referring to Amie and I) has to be a little more proactive in this clusterf**k. REALLY lady? She was in work out attire and I'm guessing by how tiny she was that the cupcake might be all she was eating that day, so I guess the moodiness could be explained. It's incredible to see how angry people can get in a setting that just gave me such joy. Ha. Sad. But so true. Anyway, I took a bunch of pictures because I was in love with the place. 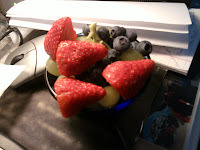 After the major euphoric sugar high, and a few hours later, I needed some fruit so I made a little salad of grapes, blueberries and strawberries. 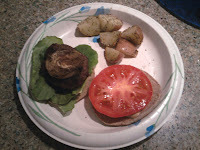 For dinner,Amie's dad made lamb burgers on the grill. 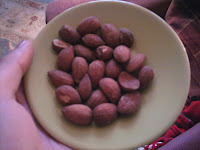 I've never had them before but they were delicious. He actually grilled an onion right into the patty and I think it was served on 100 calorie Arnold sandwich thins with some rosemary red skin potatoes. 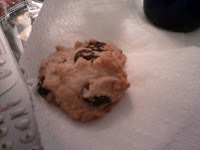 Of course, Amie's mom made these round tempting dark chocolate chip cookies so I had half of one... and then the other half, oops! Sorry... I'm no inspiration to anyone. Unless, that is, if you want to let your hair down and live a little! We went out in Georgetown and split a bottle of wine between a group of us. I loved the veramonte sauvignon blanc wine we had. Only about a glass for me because I was driving so at least I didn't take in TOO TOO many empty calories. By 2 a.m. however, I was starving and got home and starting nibbling. I HATE HATE HATE this habit. If only I snapped a picture I could have stopped myself but I ended up eating a handful of pretzels, couple crackers with peanutbutter, a slice of SALAMI (yeah, I know?) and a laughing cow cheese triangle. This seems innocent enough but it's a horrible habit and still left me unsatisfied. Oh well... Sunday's a new day! Speaking of Sunday. Here's my food. 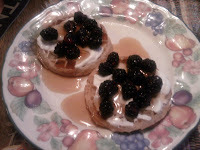 For breakfast I had some whole grain waffles topped with the Oikos Greek Yogurt, sugar free syrup and blackberries. I had a small decaf coffee and then headed out the door. Amie and I met my good friend Matt in D.C. for lunch at this little hole in the wall restaurant. 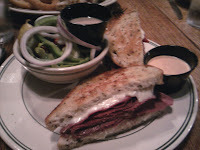 I ordered a reuben sandwich and ate half of it with a garden salad and a few of Amie's fries. I'm saving the other half for dinner tonight. I got it with the Russian dressing ON THE SIDE because 1. saves a bunch of calories and 2. saves my delightful sandwich from getting soggy. The lovely afternoon ended with a coffee from Starbucks and a lot of grad school homework. This is my break. Isn't it sad that I get enjoyment out of telling you what I eat? It's a nice escape. Anyway, as usual, I missed my healthy snacks so a few hours into the after noon I find myself eating an apple with honey and some almonds. 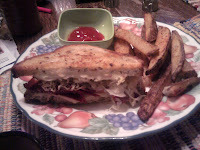 Like I said, dinner will be the other half of my sandwich and some baked potato fries. I'm looking forward to it... maybe I'll take a picture for you. It was good... very good. I had a mini snack attack after dinner but I'll be back on track as of tomorrow, promise! Got to get to my goal.